It was a quiet reunion over lunch. Well, then there was the photo shoot, and a couple interviews, and some media attention. Nancy McLain was in Rochester on Monday, July 27, with her sister, Bonnie Engesmoe, to visit Robert Kyle, M.D., Division of Hematology Research and member of Mayo's emeritus staff. 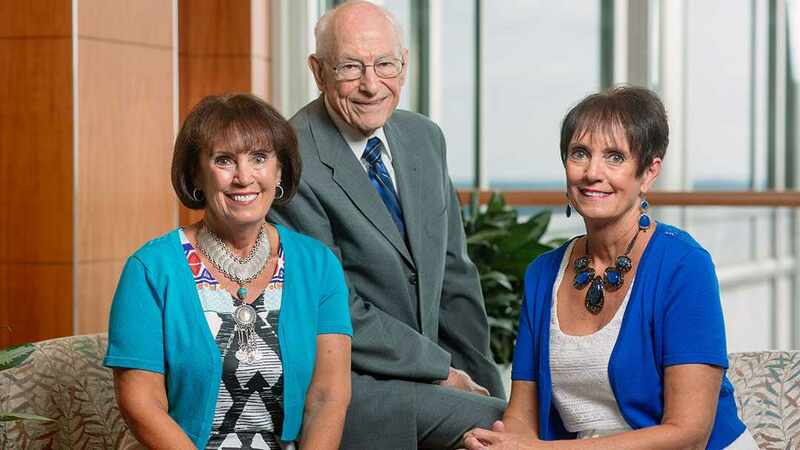 It had been 52 years since events brought the trio together at Mayo Clinic — a hematologist and two twin sisters, then just 10 years old, one of them destined to be the first bone marrow transplant recipient at Mayo Clinic. Nancy also has the distinction of being the nation's longest-surviving bone marrow transplant recipient. She was honored as such earlier this year at the American Bone Marrow Transplant Society annual meeting, where she and Dr. Kyle spoke about their experience. "I never knew I was going to be so popular by getting old," Nancy says with a laugh. She has been the picture of health since her transplant in 1963. Nancy had aplastic anemia, and her doctors had exhausted the usual treatments — cortisone, anabolic steroids, testosterone, 67 blood transfusions. Still, her platelet level was 5,000. "You get below 20,000, and a hematologist gets concerned," says Dr. Kyle. "Below 5,000 is a very dangerous situation." Nancy's pediatrician asked Dr. Kyle if he had any other ideas. The good doctor had learned bone marrow transplantation from Nobel laureate E. Donnall Thomas, M.D. Though it was a novel procedure, Dr. Kyle knew transplant was Nancy's best chance. And he only considered it as an option after learning that Nancy had an identical twin sister. After testing to ensure they were, in fact, identical twins, Dr. Kyle and his team proceeded with the transplant, and the rest (as well as the aplastic anemia), is history. Nancy and Dr. Kyle have kept in touch over the years as he checked up on her progress. "I love this man dearly," she says. "It's wonderful to come back and follow up with him over the years." But Monday was the first time he'd seen Bonnie since the time she donated her marrow to her sister. For Dr. Kyle, it's what patient care is all about. "It's always a good feeling to know that you had done something for someone, because most of the time in the practice of medicine, you don't know what particular role you played," he says. "It's satisfying and it's rewarding to see this." Nancy says that what's rewarding for her is that she can be an inspiration to others. After she spoke at the American Bone Marrow Transplant Society meeting, she says, "all of these people came up to me and wanted my autograph." Many of them were recent or soon-to-be transplant recipients. Not surprisingly, they said things like, "We want to be you. We want to live another 52 years like you." Bonnie, who was at the conference as well, recalls a woman saying, "You are finally giving me hope … you're just an inspiration." Give us your autograph and share a comment below. Then, share this story with others using the social media tools. Watch the KARE-11 TV story on the reunion below.